Welcome to our Huion H610 Pro review, where we compare this capable graphics tablet against it’s more expensive competitors. If you are looking to get a graphics tablet that features top quality components, a high standard specification and good support and reliability, you might think that we would recommend that you head over to Amazon and buy the latest and greatest Wacom Intuos tablet. But not everyone wants to pay those prices, especially if it is their first graphics tablet that they are not sure if they really need or want to use. Other, cheaper brands such as Genius and Monoprice do offer excellent products that have great specs and good customer reviews, but nothing quite feels like a Wacom tablet. Huion are releasing a newer (redesigned) version of their flagship graphics tablet, the H610 that features some specification that blow a Wacom counterpart out of the water and at a price that is much cheaper. The main difference between the H610 and the H610 Pro, is the resolution of the active area and the “refresh rate” where the tablet checks the position of the pen. The higher these values are, the better. The new H610, released late November 2013, is a 10inch x 6.25inch top-end graphics tablet that offers features such as 2048 levels of pressure sensitivity and 5080 lines per inch of resolution on the drawing area, aiming it squarely against Wacom tablets that cost twice the price. This higher the number of LPI, the more accurate your pen strokes will be. What is the stylus like? 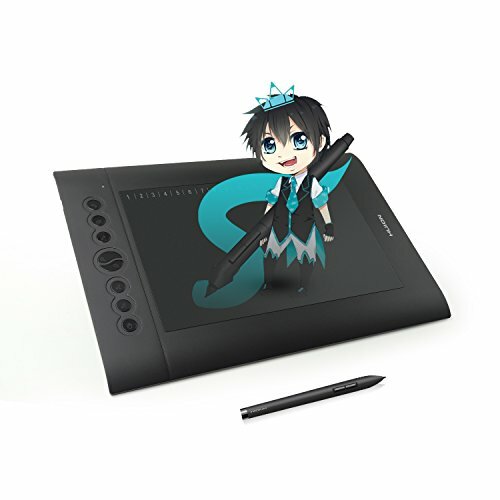 Huion have also opted to include their new P80 slim and light, battery free stylus, similar in design to “that other company” and definitely something that other, cheaper manufacturers, just can’t quite live up to. However, the stylus does need to be recharged via the supplied USB cable – so the hype is not quite the truth here. They do claim that only a 2 hour charge will power the stylus for 800 hours – which is quite impressive. Not to skimp on the buttons, the Huion H610 Pro has a range of “hot keys” and “cells” that can be customised to your needs and are easily accessible when you are working. There are 8 “Express Keys” at the left hand side of the tablet and 16 “Function keys” that are along the top of the drawing area, meaning that they are easy to get to – but possibly might get in the way if you draw on to them. Although, this is something you will get used to. The Huion H610 Pro connects to your PC or Mac via a provided USB cable, rather than a wireless or Bluetooth connection, which would have been nice to have. However, not even Wacom include this as standard, making you buy an accessory kit. Operating system support is very well featured on this new Huion tablet too. Surprisingly, it support Microsoft Windows 2000, XP, Vista, 7 and 8 which covers pretty much all bases. Many new Wacom tablet insist on newer versions of Windows to operate properly, so this is a big selling point for this tablet. Max 10.4.0, 10.6.0 and OSX are supported, as are Ubuntu, CentOS and Redhat Linux flavours, if you are a user of these operating systems. There is also additional drivers to make the tablet work with Adobe Photoshop, which can sometimes make the difference when using a graphics tablet. Without it, you may not be able to use all of the features and levels of pressure sensitivity. The drivers and manuals can be downloaded from here if required. Should I buy this Huion tablet? I don’t think I have reviewed a budget price graphics tablet that quite meets the specs Huion have delivered for the price. They are a reliable company and have produced a number of other tablets, all of which get good reviews on Amazon. We have not reviewed any of their other products on this site, but we have been aware of Huion for some time and never thought that they would offer such a feature packed product. If you can’t quite find the logic to put down the cash for a Wacom tablet, then this is definitely the one I would suggest you buy. Click this link to view the current price on Amazon. Is the Huion tablet compatible with paint tool sai? I have never used PaintTool SAI, but I can see that there are other people talking about using a Huion graphics tablet with this application. I’ve been in the graphic field for over 30 years, using many different digital tablets and software programs. I recently got the Huion H610Pro and, for the price, find it totally awesome! Works fantastic with Photoshop and many other drawing programs such as Gravit Designer, MediBang Paint Pro, FireAlpaca, just to name a few. So, I’ll give this puppy a ten along with a two thumbs up.